China – Beijing, a city that houses 22 million people and one of the 7 wonders of the world that many dream of visiting (us four included)! 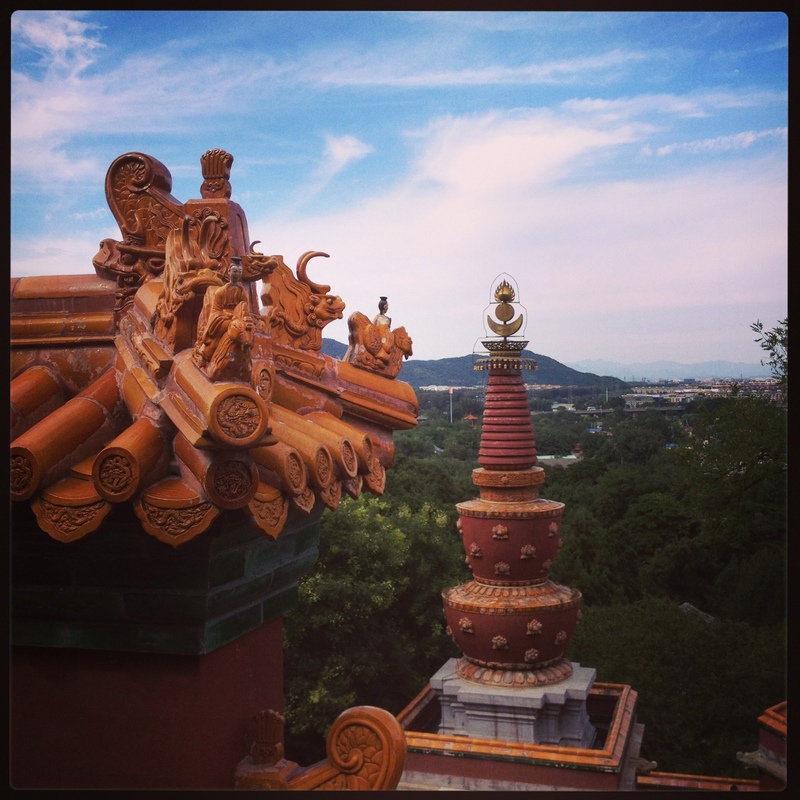 We have come to know Beijing as a city that has a new surprise in store for you each day, so let me tell you a bit about them. 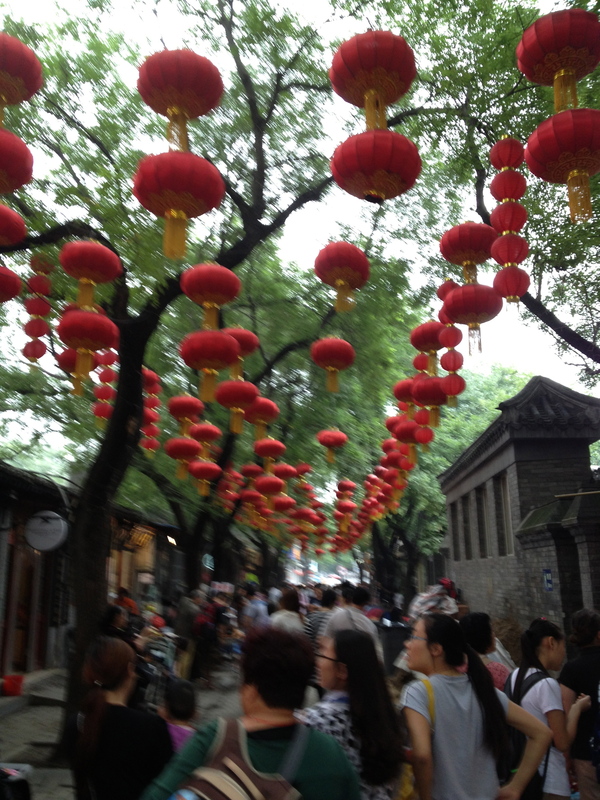 The first surprise we encountered was our hotel called Hutong Ren, This little place of rest boasts only 8 rooms and is located on a side street of the very crowded and lively Dongcheng area. The staff gets it perfectly – after a day of intense sightseeing (where the masses of people, smells and sounds overwhelm you, and take you by surprise each time) – you need a place to kick back & get back to balance. So at Hutong Ren, we relished the wonderfully calm background music, the delightful assortment of teas, the laughter of the sweet & helpful girls that work there and the enthusiastic welcome of Blackie, each time we entered back “home” (Emile & Filou particularly liked this super sweet dog, who would crawl on their laps for cuddles or run and play with them). The Dongcheng area is one of the city’s interesting districts where you can get a great, first glimpse into Chinese culture. It is a maze of charming, small streets & alleys (hutongs), which boast an interesting mix of buildings, food establishments and stores. Side by side you will find designer stores (where you can buy the most beautiful silk scarves, bags and clothing) and little food and nick-nack establishments (some completely falling apart, others doing their best to cater to the tourists). And the city seems to have enough of those – apparently about 2 million foreign visitors and 60 million domestic travellers visit Beijing each year). So, you can probably imagine how busy those streets were! The Dongcheng Hutong area particularly comes to life at night as it is then when many street sellers crowd the hutongs and you can buy anything from silly toys (and the Chinese do LOVE their toys – teenagers walking around with wooden noise makers that we would consider buying for toddlers or putting silly, fuzzy animal ears on their heads as a headband), to meat or crickets on a stick! Each night we went out, we saw something different and it was always a great adventure to decide what to eat, what to do to cope with the masses and not get run over by one of the many honking motorcycles, food carts or bike taxis, or how to overcome the incredible smell that is apparent is some of the streets (the exploration was so worth it as it was super fun, but the smell is one that I still find hard to forget)! 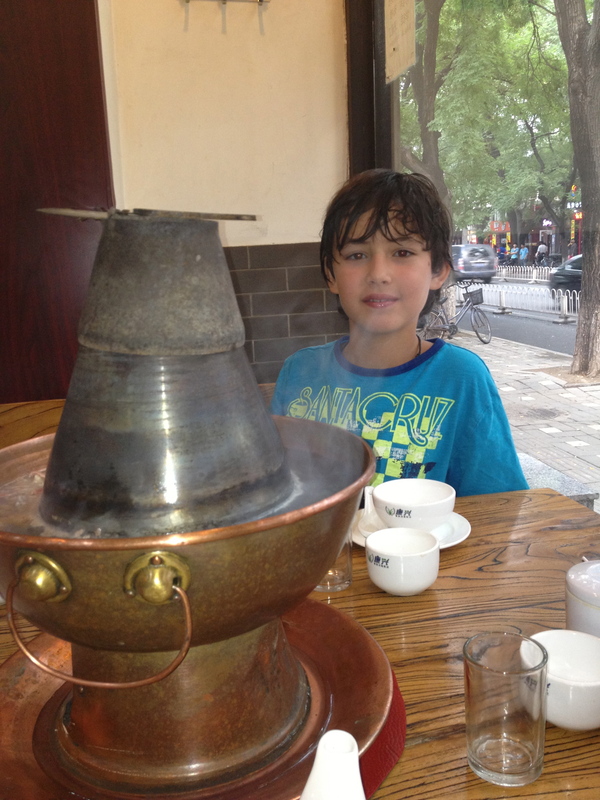 Our first night, we enjoyed a nice hot-pot – boiling pot of water in which you cook your own vegetables and meat (a good first choice!). 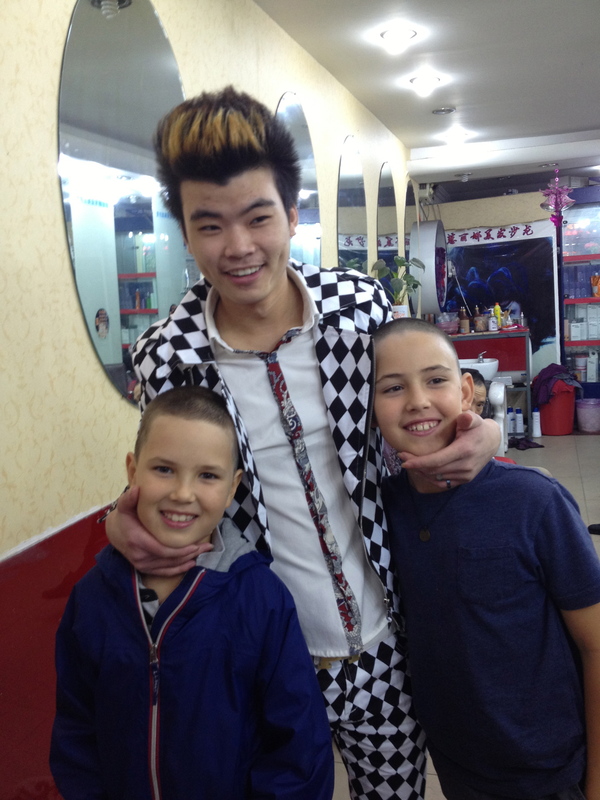 Very close to the restaurant, we saw a barbershop with a young, funky hairdresser who seemed to know what he was doing. Emile & Filou had talked for a while about getting their hair cut off (practical look for on the road that would require little maintenance and a crazy experiment that isn’t as easily tried at home). 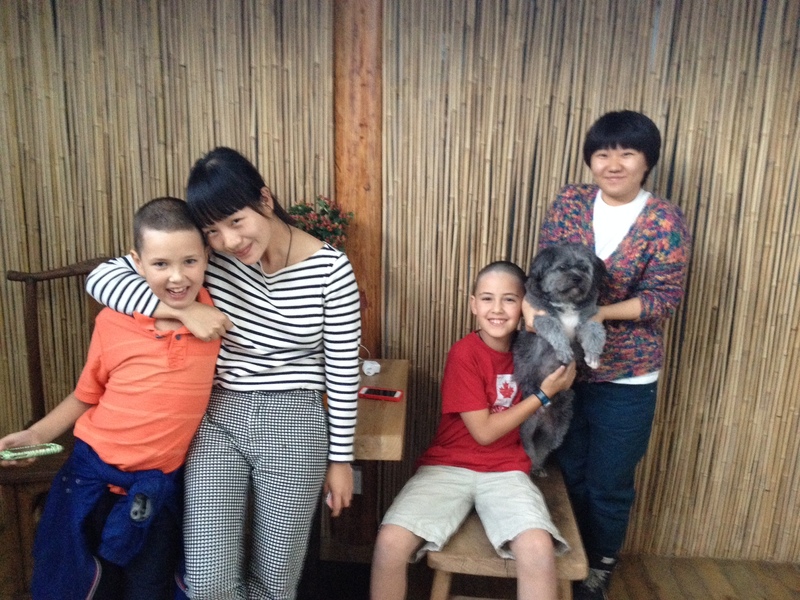 However, we were surprised that Filou was dead-set on getting his buzz cut that first night! But, we happily obliged his enthusiasm and entered the shop. 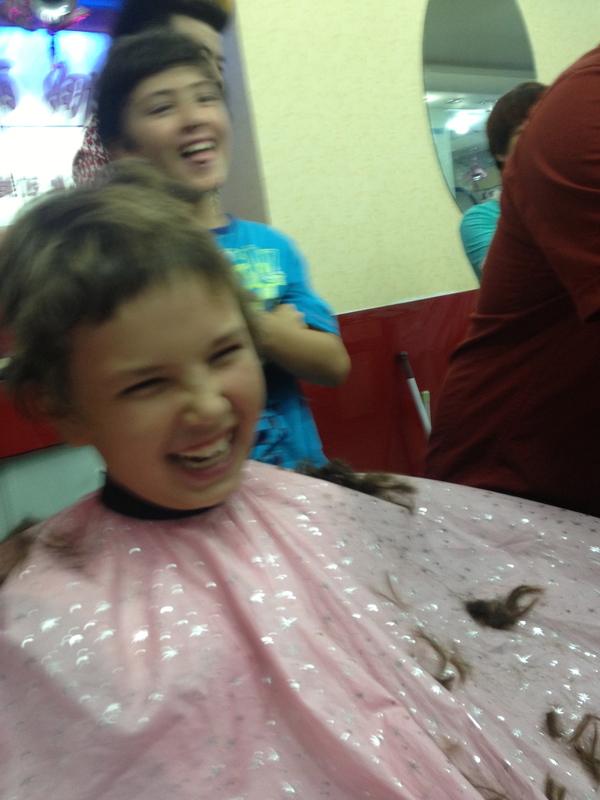 During the whole haircutting process, Filou laughed hysterically! And once his new look was completed, he showed similarities to a little monk – but he was happy as pie (and still is). Emile (a bit jetlagged) was not quite ready for this adventure and got a regular haircut. 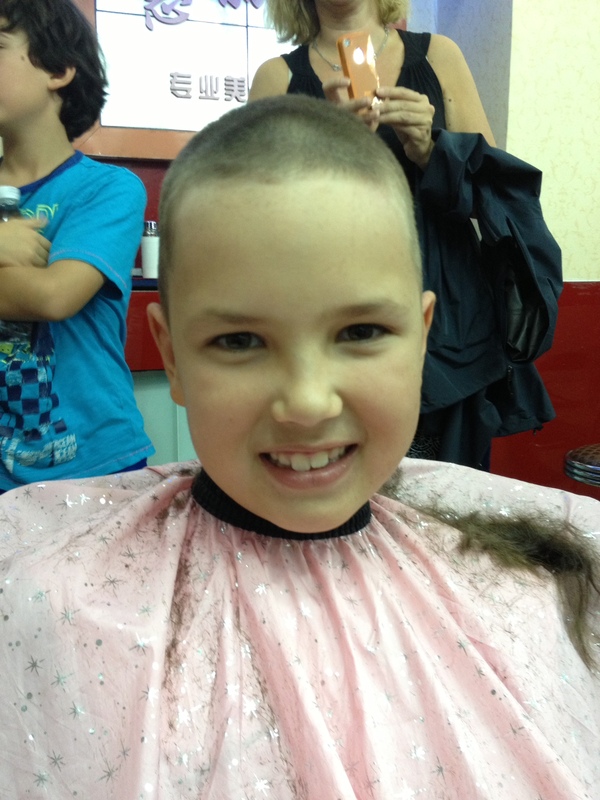 Although two days later (after some encouragement from his little bro – who wanted to become the bald brothers) he went back and did the same. The boys’ new look (which is a bit more in line with Chinese kids), has proven to be somewhat of a defense mechanism as on many occasions, the kids are being stopped, stared at or taken a photograph of (some Chinese have just never seen Caucasians before). It should be said, that the attention does make them feel like little rock stars! 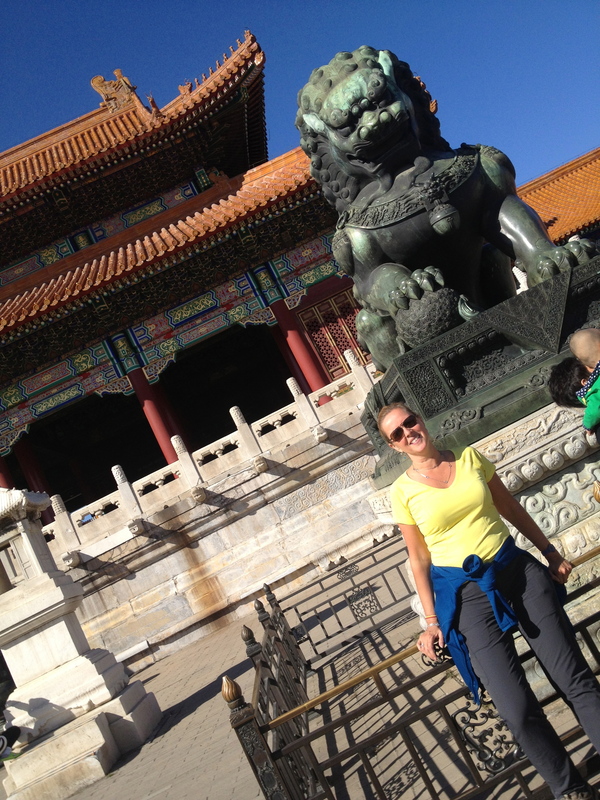 Of course Beijing’s incredible history is mind-blowing and we joined the masses in visiting some of the city’s top attractions. The changing of the guards & flag lowering ceremony at Tiananmen Square was interesting in that we thought there to be a major festival due to the thousands of people – however we later were surprised to learn that it was just a regular day! The Forbidden City (the Imperial Palace and home of the emperors for over 500 years – from the Ming to the end of the Qing Dynasty) was incredibly impressive in size and history, and the Summer Palace (the largest and best preserved imperial garden in China) was a beautiful, serene place, that the boys most enjoyed. 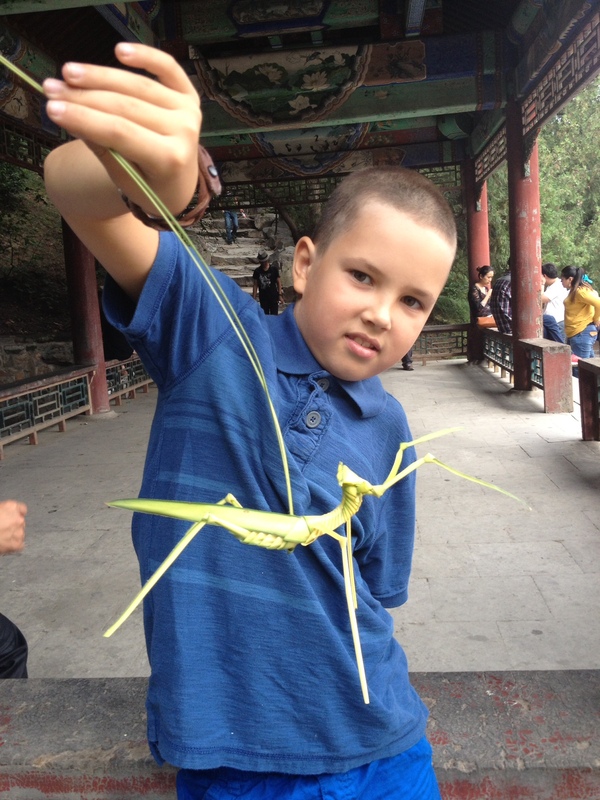 At the Summer Palace, Filou focused in on a local artist who was making grasshoppers out of bamboo leaves. He was charming the man with his attention and after sitting with him for a while, a nice Chinese couple appeared and kindly offered him one of these crafts (they were just so taken by his enthusiasm). Emile, too was lucky to get one – and he happily gave his away to one of the super-cute little Chinese girls he met in the park later that day. 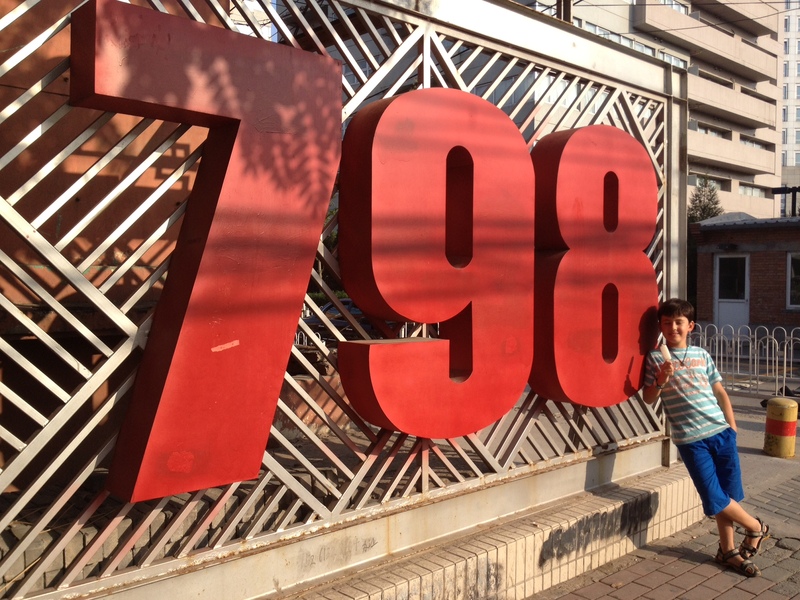 798 Art Zone is Beijing’s leading concentration of contemporary art galleries and shops (and many wonderful little cafes). This thriving artistic community, located in the Chaoyang District is housed in various 50-year old decommissioned military factory buildings of unique architectural style. It was a place on Anthony’s hit list! So we spent a lovely afternoon browsing through many interesting galleries and funky shops. We even came across an outdoor rock concert (with a terrible sounding band!) – but in a cool courtyard with fantastic vibe. We left the arts vibe and enjoyed our best and cheapest meal in Beijing when we found some 5-6 food carts lined up outside on the street (the four of us feasted for about $5). When waiting for our last portion of delicious grilled vegetables, tofu and meat – Emile almost got run over by the food cart when it suddenly packed up, rushing away in great hurry when the police arrived. 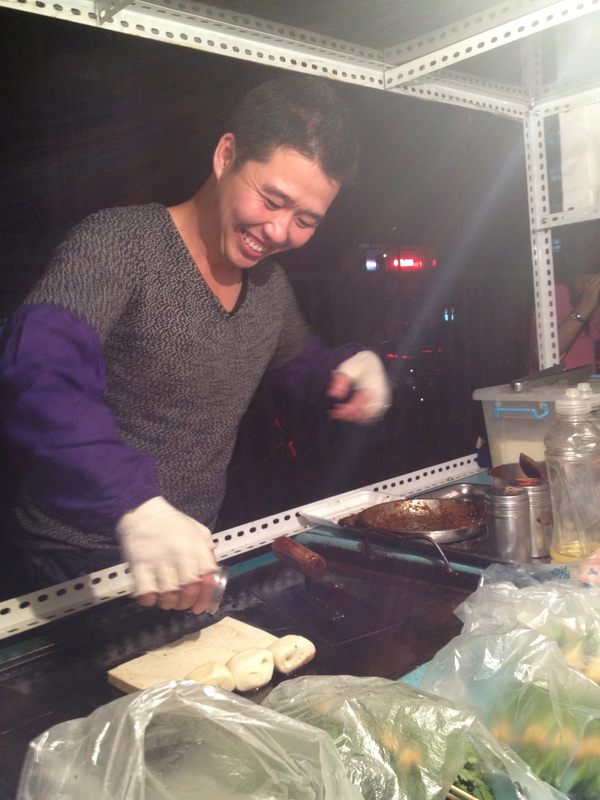 Quite the nightly adventure that the boys still talk about – illegal street food was definitely a new experience for them! 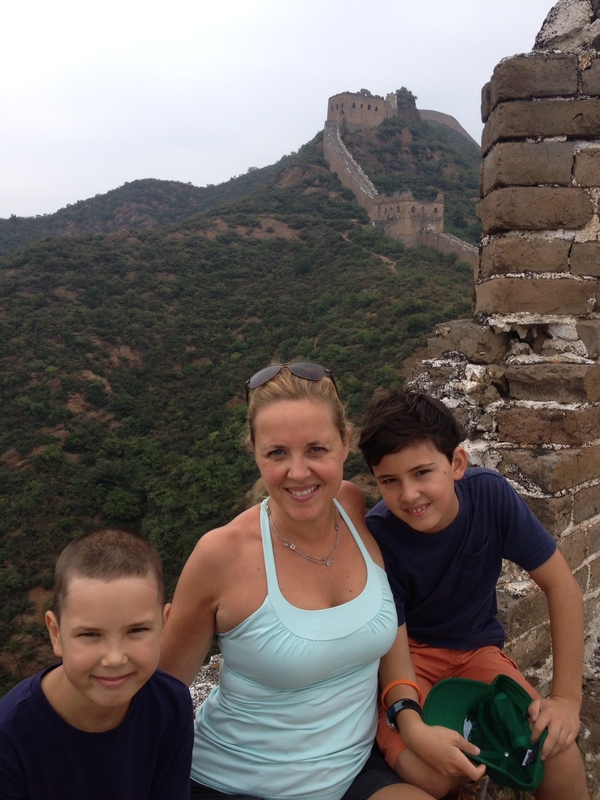 But the highlight of our stay in Beijing was undoubtedly our walk on the magnificent Great Wall of China. We picked a perfect day for our adventure as it was slightly cloudy and therefore not too hot for our big walk. 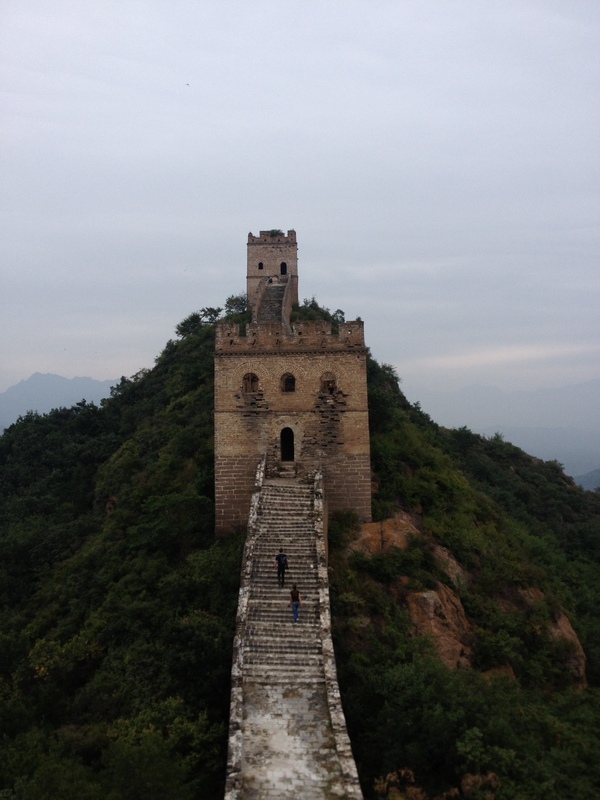 We chose to go to the “Wild Wall” (the portion of the wall between Jinshanling and Simatai). This portion is still in its original state (has not been rebuilt or renovated like some other portions) and is a lot less touristy due to its more distant location from the city (about 2.5 hours outside of Beijing – instead of Badaling which is only 1 hour away). We usually like to do things on our own, but we chose to go with an organized tour for this one (as we didn’t want dishonest cab drivers to ruin our day). We learned that the Great Wall is in fact a discontinuous network of wall segments (and not continuous as many think) built by various dynasties to protect China’s northern border. This UNESCO World Heritage site is over 20,000km long, and took millions of people (soldiers, common people & criminals) over 2000 years to build. It is the longest man-made structure in the world, and seeing all those big rocks, it must have been a tremendous job to create this masterpiece (without any tools but bare hands)! Once arrived, we chose to take a cable-ride up to the #10 Tower on the Great Wall – from there, we would make the trek to tower #20. Frankly, I was ignorant in thinking that the Great Wall of China was an ancient structure that once arrived at, could pretty easily be walked upon. O, was I wrong – it is 4 days later now and my calves are still in serious pain – best stair-master ever! 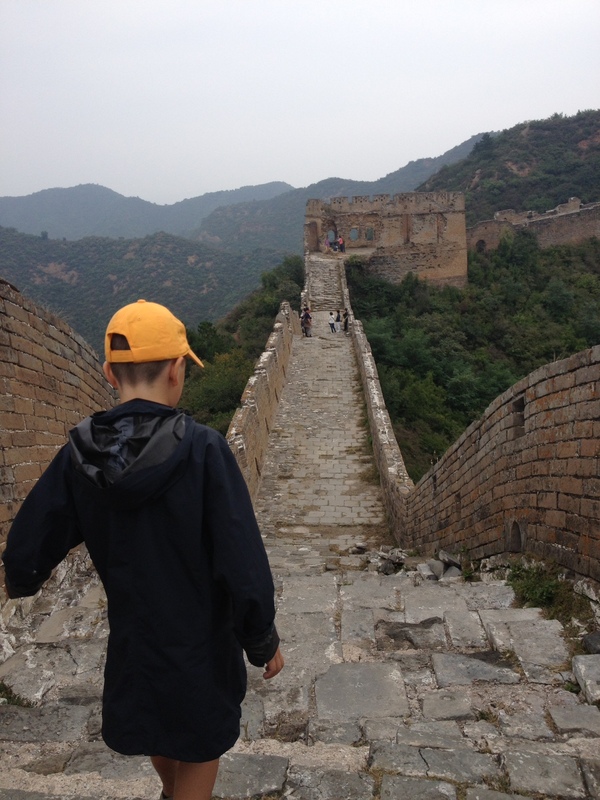 There were several portions of the Great Wall that we could only climb, using both hands and feet –as double strength was needed to pull ourselves up on the incredibly steep staircases (nothing for you mom!). But it was little pain for the privilege to be walking on this most incredible, historic structure. Gazing out, there was stunning nature all around us – looking left were the mountains of China while paying attention on our right, and we were looking at the gorgeous scenery of Mongolia. It is without saying that the Great Wall of China needs to be preserved at all cost and no littering of any kind is allowed (including the human bathroom kind). If you have to do your business (with no facilities anywhere in sight) you need to climb down from the Great Wall to find yourself a secluded spot. And of course, our little boys with small bladders had to (they thought that this unfortunate incident made for a cool story though, as now they can say they did “pipi” in Mongolia!). We met several sweet locals on the Great Wall – encouraging us to keep going and trying to sell us some souvenirs. But we were happy, taking our memories and our many “snaps” with us from this most wonderful day. 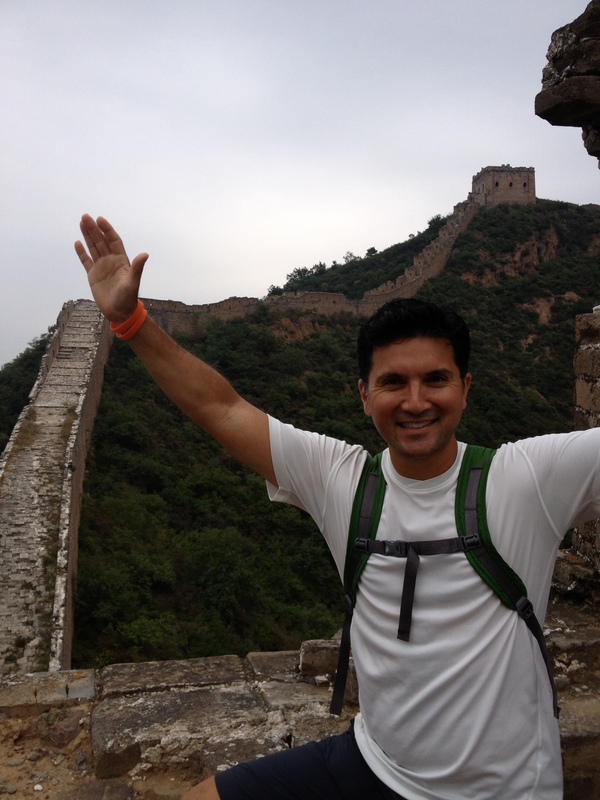 – The incredible beauty and steepness of the Great Wall of China! – The behavior of the Chinese, which we at once consider to be rude (spitting, making loud noises during meals, pushing – an 80 year old Chinese woman gave me a mean push when she felt I was taking too long trying on a scarf in front of a mirror) and very kind (laughing and staring at us, being thankful for the opportunity to take pictures of us, giving us gifts, assisting us in showing how a meal is properly eaten or giving us directions, helping us make the best of our stay in their fascinating city)!